Board your Avalon Suite Ship® and start with an overnight cruise to Vienna, sail from Austria to Germany as you sail to Passau, then the Bavarian city of Regensburg to see the 12th-century Old Town Hall. Your Germany vacation continues as you cruise to Nuremberg, where you can choose from two three guided excursions—guided tour of Roth, or Nuremberg classic city sightseeing, or a tour of the historic Nuremberg Rally Grounds of WWII notoriety. Your picturesque European river cruise continues to Nuremberg from where you will join a full day excursion to Munich. A Beer Expert will join your cruise in Nuremberg to travel with you to Basel and will hold lectures and tastings to introduce you to food and beer pairing. Sail to Bamberg, the Franconian town where the myth of the good German beer is true, for a guided walking tour of the historic home to imperial dynasties. Continue to Frankfurt for your choice of two included guided tours, and a tour of local breweries and on to Rüdesheim and through the magnificent Rhine Gorge. Your European river cruise takes you to the splendid Strasbourg, France, with its gothic cathedral towering above its stained-glass and murals, before cruising to the beautiful Breisach, Germany—gateway to the magical Black Forest. Enjoy a day of storybook surroundings, sumptuous bakery specialties (such as Black Forest Cake), and a glimpse into authentic Bavarian life through the generations. 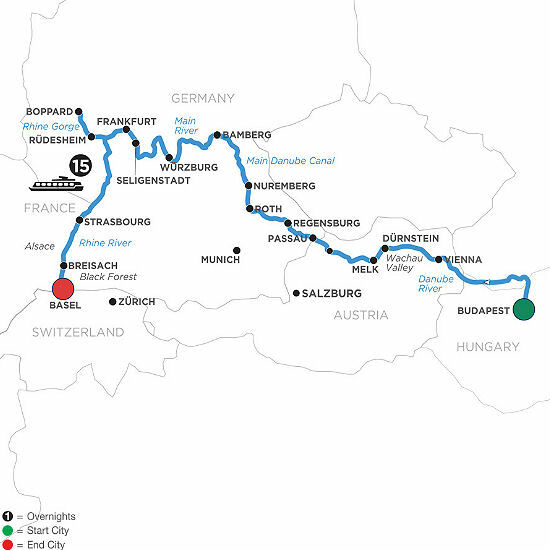 Your river cruise on the Danube, Rhine, and Main Rivers comes to an end in Basel, Switzerland, but your memories of this tremendous adventure through many of Europe’s most beautiful destinations views will last a lifetime.